Come to the BIG WAVE CAFE for a delicious Spaghetti Dinner prepared by Café Owner and Chef Brian Williams and his staff on Thursday February 21st, served from 4:30 to 7:30 pm. Once again, the Big Wave is hosting a dinner that benefits the NORTH COUNTY FOOD BANK. A big believer in giving back to the community, and by providing benefit dinners for local non-profits, Williams does just that. All of the proceeds from this dinner go to the Food Bank. The menu includes spaghetti, garlic bread, salad, dessert, coffee, tea and sodas. Wine and beer will be available for purchase. Tickets are $15.00 and will be available at the door, or they can be purchased in advance from any Food Bank board member – Tom Ayres, Blaine Bocarde, David Flemming, Bill Guy, Anna Hawkins, Jackie McCrady, Mark Roberts, Holly Smith, Susan St. John, Lauren Strylewicz, Bill Wright. The North County Food Bank is an all-volunteer, non-profit organization serving the people of North Tillamook County from Twin Rocks in the south to the Tillamook-Clatsop county line in the north and east out the Nehalem Valley. Last year, the North County Food Bank served 860 people in 278 households and distributed 97,374 pounds of food. The NCFB offers free food and free serviceable used clothing to anyone in need who resides in their service area. 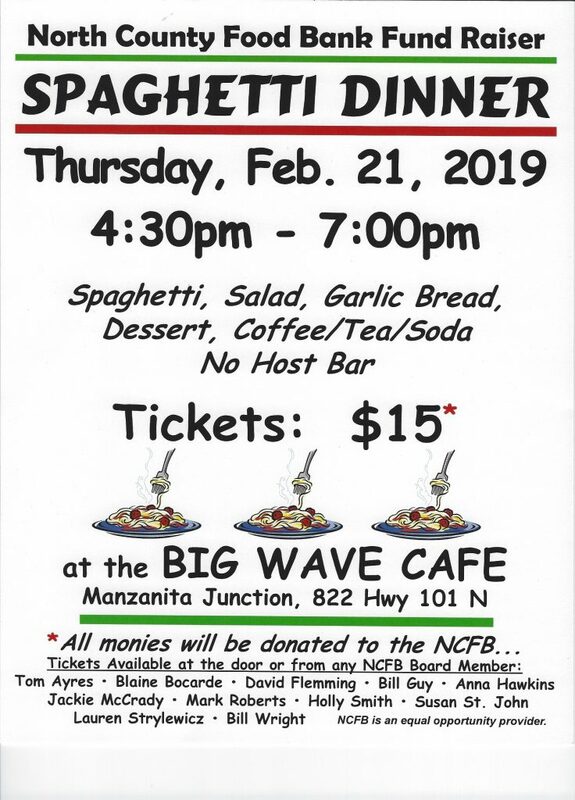 Join us for a great dinner with great friends to benefit a great cause, the North County Food Bank at the Big Wave Café, 822 Laneda Avenue in Manzanita, on Thursday February 21st from 4:30 to 7:30 pm.